ABOUT MUSKMELON | Jane Lear. Writing on Food and Travel. Our summer full of hot sunny days has resulted in fruit that’s on the small side, yet bursting with sweetness and juice. Take muskmelon, for instance—what most Americans think of as cantaloupe. I’ll get to why in a sec, but first, you should know that a true cantaloupe (Cucumis melo var. cantalupensis) has very little to no netting on the rind. It’s commonly found in Europe, particularly France, where it’s been cultivated for 500 years or so. Heirloom cultivars such as Noir des Carmes, Petit Gris de Rennes, and Charentais (which, happily, is increasingly grown in the United States) have complex, resonant flavor and make superb dessert melons. The muskmelon (C. melo var. reticulatus), which gets its name from the bewitching musky fragrance of orange-fleshed varieties, is distinguished by the reticulated, or netlike, tissue that covers the rind. Heirlooms include Jenny Lind, Blenheim Orange, Emerald Gem, and Anne Arundel. The last was named for the countess who married the first Lord Proprietor of the Maryland Colony, and appeared in many paintings by the Peale family (especially Raphaelle Peale) as a symbol of their Maryland roots. I’ve used Will’s book as a reference for more than a decade, but only now got around to asking him why he threw melons into the mix. “There was no logical reason to leave them out,” he explained in an email. “Melons have been cultivated in gardens for thousands of years, although perhaps for some people they were viewed as the aristocrats of the kitchen garden. Not all melons are sweet and sugary: the Makataan Melon of South Africa is cooked like squash even though botanically it is a watermelon (I am growing it this year); the Akapnou Melon of Cyprus is used like a cucumber (it is depicted in Roman era wall paintings); and Vine Peach, which I think hails from India, is best used in salads and curries almost apple-like in texture.” The man is a national treasure. By comparison, my personal experience of melons would fit in a pinhole. 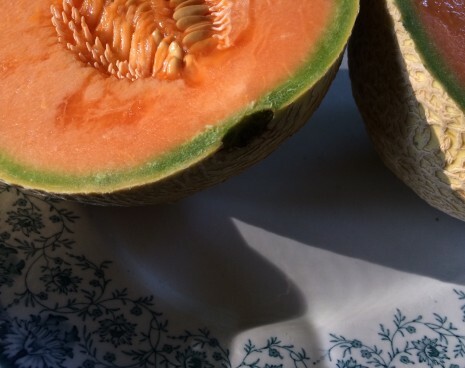 My grandparents always had a few melon vines—I think they appreciated their luxuriant sprawl—and muskmelons, in particular, were enjoyed for breakfast, lunch, and supper. “Just looking at a slice cools you off,” my grandmother would remark. The classic pairing of melon and prosciutto wasn’t in her wheelhouse, so to speak, but melon with thin slivers of country ham—light yet satisfying in the heat of midday—certainly was, and I love it still. Along the same lines, during my Gourmet days, executive food editor Zanne Stewart rocked my world with a mouthwatering combination of melon, Serrano ham, and arugula with smoked paprika dressing. Spanish Serrano ham has a heftier texture than prosciutto, and Surryano ham, from Edwards Smokehouse, in Virginia, is a fabulous all-American alternative. In a perfect world, I would have made this tart ahead of time so I could give you chapter and verse, but life got in the way. So here’s the deal: A blind-baked tart shell is not complicated, and I think this pastry cream recipe, which is flavored with poire William, makes a good jumping-off point for the base layer. As for the melon, your best bet is the vine-ripened fruit from a local farm stand or farmers market. Choose one that’s heavy for its size, with a small couche—the part that lies on the ground, thus is flattened and pale. The melon’s blossom end should yield to the touch and smell like the last days of summer.